Blitzwolf BW-FWC2 is a foldable wireless charger capable to deliver quick charging to devices with wireless charging feature. Paired with standard USB charger, BW-FWC2 will deliver 5W power, which is quite slow for today’s standard. If we use USB wall charger with Qualcomm QuickCharge technology, this charger will deliver 7.5W charging for compatible Apple devices and up to 10W charging to Android devices. One of my main reason of getting this charger is its foldable design. It allows this charger to be small enough for travels (136 x 70 x 14 mm), but still able to charge our phone on angled position, making it easier to use devices with FaceID technology. 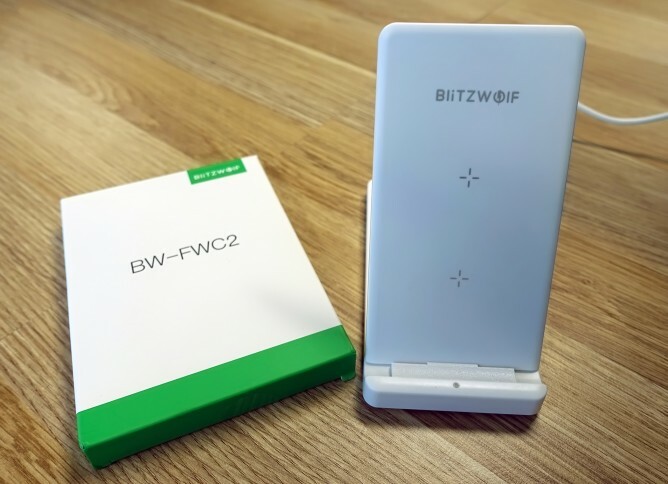 According to its official page, Blitzwolf BW-FWC2 is equipped with foreign object detection feature and multi layer protection. It can charge phones in a case up to 3 mm thickness. It does not come with bundled wall charger, but we can easily use the ones we already have. I use charger from the same brand, Blitzwolf BW-S6, with 1 normal USB port and 1 QuickCharge 3.0 port. This wireless charger uses the modern USB-C port instead of conventional micro-USB, making it more future-proof for when our other devices have moved to the new era of USB-C standard. The overall build feels somewhat plastic and lightweight, but it’s probably more about my personal taste. I decided to put it in my travel pack instead of everyday use.